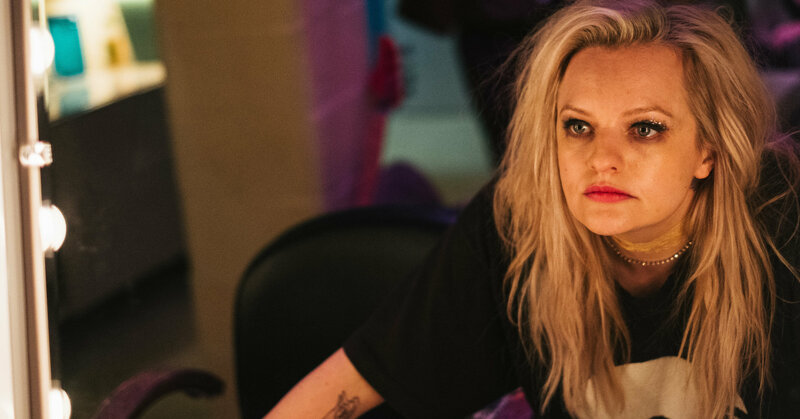 At least once in every woman’s career, she should get to scream and shout and let it all out the way Elisabeth Moss does in “Her Smell,” a go-for-broke rhapsody that’s as harrowing as it is cathartic. Playing a famous punk singer spiraling into chaos and addiction, Moss spends more than half the film in a fit of rage, inching toward combustion. It’s a volcanic performance that leaves you shellshocked, wondering where it came from and what it will do to your blood pressure. The first three chapters of “Her Smell” ― there are five in total ― sketch a portrait of an artist as a madwoman. Years into her career, Rebecca Adamczyk (Moss), who fronts a trio using the stage name Becky Something, is out of control, having invented a larger-than-life persona and then attempted the mind-altering task of living up to it. She’s a hyper-articulate narcissist with a buffet’s worth of booze and drugs swirling through her body at all times. We first see her storming though a cavernous concert hall crawling with enablers, then parading around a recording studio where she logs more fights than she does songs, and finally careening about in another venue whose neon-red glow resembles the ninth circle of hell for anyone who crosses Becky’s path. In each act, Moss grows more guttural. She screams and scolds, operating according to the constant party that’s happening only in Becky’s head. Moss’ work is so visceral that she, like Becky, seems about to collapse ― a fever pitch measured by the glitter and mascara smeared across her face. Becky’s eyes dart to and fro, looking for support wherever they go. When she doesn’t get it, she doubles down on the mania, as if working overtime to draw onlookers into her orbit. It’s as delicious as it is terrifying. In other words, it’s perfect. These movies explore fractured psyches, revolving around difficult protagonists who’ve reached their breaking points. Sometimes their neuroses are explained; other times they’re just there, festering. (Becky’s largely stem from issues with her father.) Roles like this give actresses the chance go big, ensnaring us in melodrama that’s teed up to a 10 and challenging the way women are expected to behave. By the time Becky storms into a dressing room threatening to excise her own infant based on the counsel of a shaman who won’t stop waving a sage stick, it’s hard to know whether to chuckle or gasp. Considering the arc of her career, Moss is a particularly fascinating choice for Becky. We first got to know her in quiet roles on “The West Wing” and “Mad Men.” Playing upstart Peggy Olson on “Mad Men,” Moss spent seven television seasons slowly shedding her meekness, almost like she was teasing the audacity that would follow. There isn’t an ounce of Peggy in Becky Something. Since “Mad Men” ended in 2015, Moss’ best performances have been her most deranged. She proved as much in 2015’s “Queen of Earth,” another collaboration with “Her Smell” director Alex Ross Perry. And again in Cannes prize winner “The Square.” And even more so in “Us.” Armed with gold scissors and a devilish grin, Moss gave Nyong’o’s lunacy a run for its money. But she played a different key in Jordan Peele’s horror hit than she does in “Her Smell.” There, she was slinky and seductive; here, she’s abrasive, vile and ironically lovable. One chief difference: Moss was a villain in “Us,” but “Her Smell” isn’t about villainy or psychopathy. Becky is far too ordinary for that, no matter her conduct. When Becky’s bandmates (Agyness Deyn and Gayle Rankin), mother (Virginia Madsen) or ex-boyfriend (Dan Stevens) strike back at her invective, Moss breaks Becky’s high, momentarily, to reveal a quick anguish. Becky knows she’s a mess; she just doesn’t know how to change. That’s why the movie’s final two chapters, which follow a post-rehab Becky who is now starkly isolated, are so vital: She was human all along, even when her actions were inhumane. 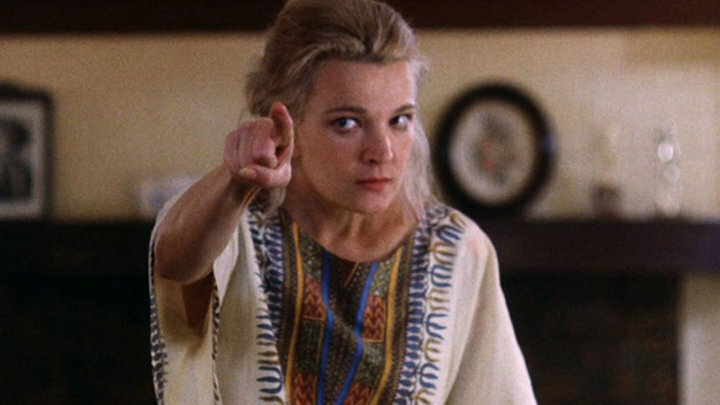 The scenery that encircles Moss in “Her Smell” undergirds her performance, just like John Cassavetes’ direction did for Gena Rowlands’ similar work. Portions play out like a horror movie, the cacophonous rock ‘n’ roll trappings mirroring what it must sound like to be inside Becky’s head. (The staccato score, composed by Keegan DeWitt, feels like an oncoming panic attack in music form.) Perry’s camera is constantly roving; it rushes to find Becky as she scurries from room to room, expecting all to follow. Watching the frenzy unfold, we brace ourselves for what might come next, almost like the walls are closing in around us while Becky keeps monologuing her every alliterative thought. Any skilled actress should get to have this much fun. There’s a release in watching everyday women rage against the machine. When red-carpet veterans like Moss do it, it’s an especially powerful antidote to the glamorous poise they’re required to exhibit ― a safe way to jettison the careful images they’ve constructed for public consumption, or else to challenge our own assumptions about what a famous woman can look like and how she can behave. Becky, in turn, is one of the great contemporary roles: Blanche DuBois without the polish. “Her Smell” is now open in limited release. It will expand to additional theaters throughout April. Pharrell Williams (Getty Images) Pharrell Williams. In 2019, surely no actor could. On today’s episode of DC360, Grio special.